October Afternoon Boarding Pass and A WINNER! Beautiful layout as always! Am definitely going to use a garland for my December Daily! For me Christmas and Thanksgiving are a tie! I couldn't pick just one LOVE them both! Congrats Elizabeth! Just send me your email address and I'll get your $20 gift certificate code right to you. Thanks everyone for playing along! I love family vacations. 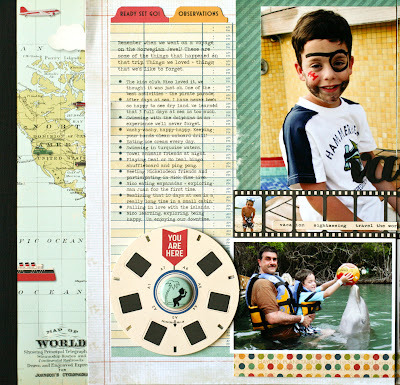 Showing Nico different parts of the world, relaxing, exploring and just spending time together in different places - these are some of my favorite memories. I keep a travel journal and fill it with stories about our adventures. And some day I'll get every single one of those stories down in our scrapbooks. 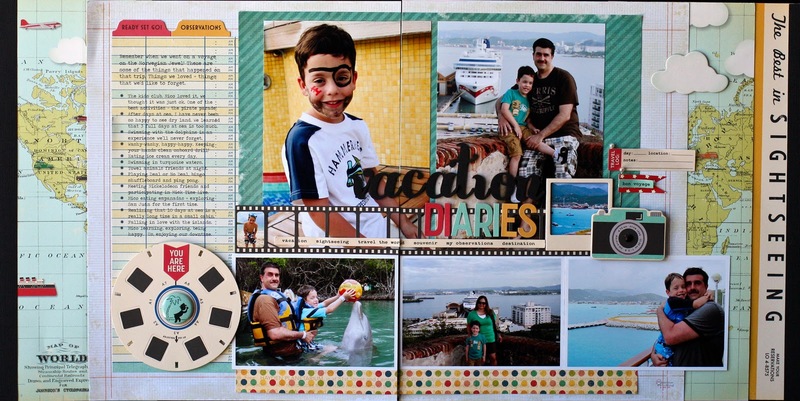 For now, I like to do highlight pages that cover an entire trip in a 2-page spread. October Afternoon's Boarding Pass was perfect for the generic travel theme I was looking for. 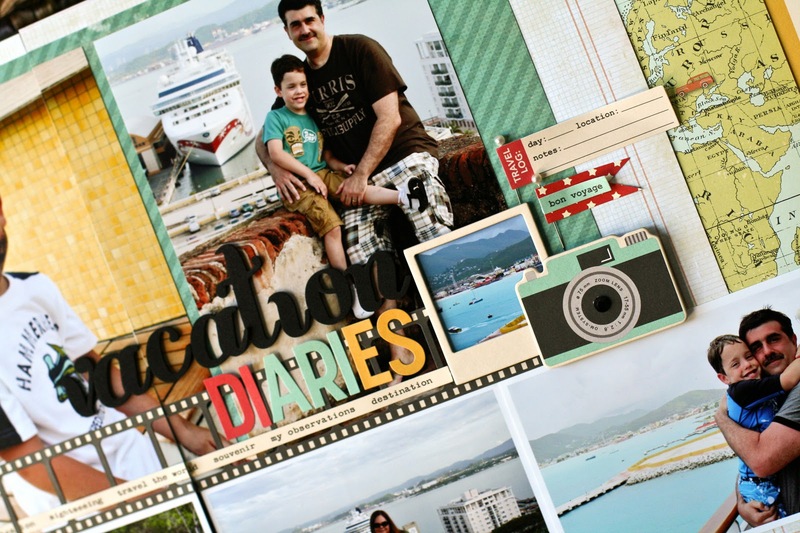 Even though these stories are from our recent cruise, I wanted to keep the focus on the photos and travel diary theme instead of the "nautical" theme - that page will probably come later. I thought this camera and polaroid would make a great focal point and a place to ground my title. cannon, learning to snorkel, exploring Old San Juan) - lots of random things that he experienced. 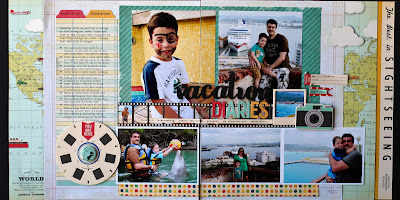 I want to remember those things and with this layout I can! A quick share today of an old Cricut project from this past summer. A few simple shapes and some of my favorite pictures. The sand dollar shape was covered with Muddle Puddles by Creative Imaginations for that sandy texture. And topped with a real tiny sand dollar I picked up at the beach. 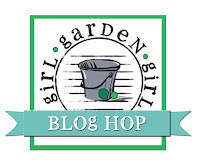 Don't forget to leave a comment on the blog hop below for a $20 gift certificate from twopeasinabucket.com. You have until midnight (EST) 11/7/11. I will chose a random winner on 11/8/11. 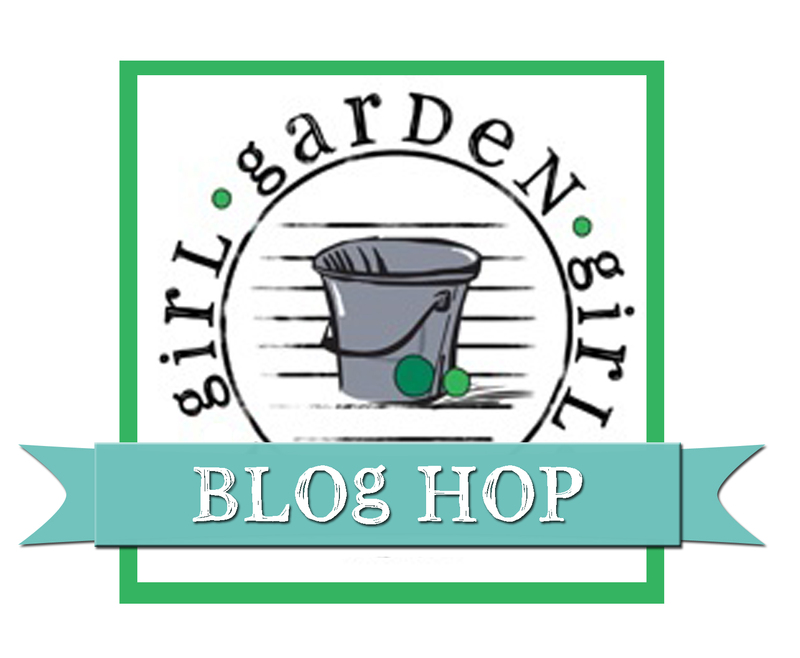 It's a Two Peas in a Bucket Garden Girl Blog Hop! 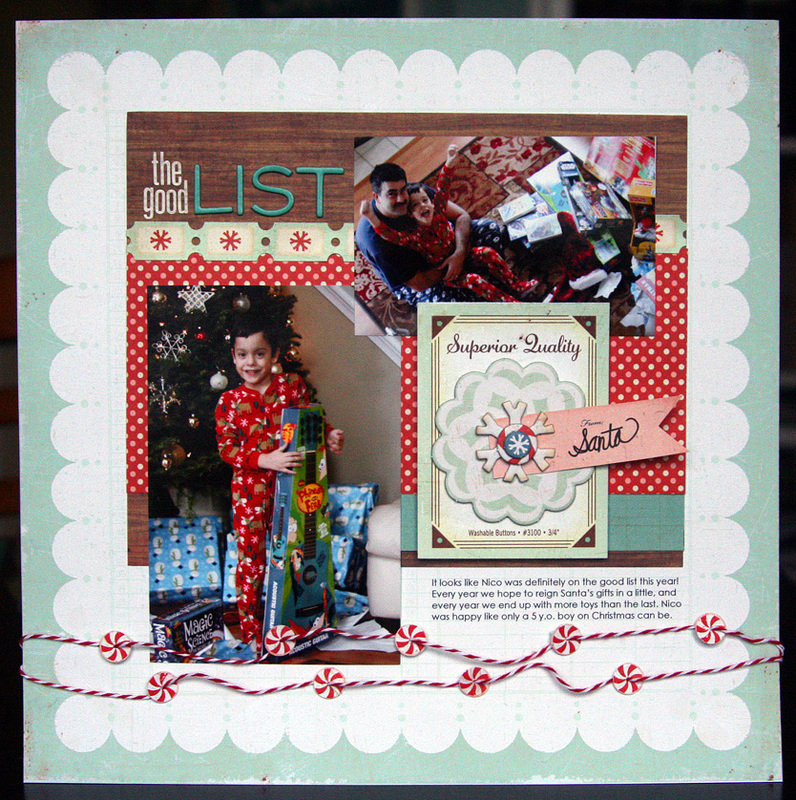 For my special project, I decided to do a Christmas morning layout. Did you know we are just 53 days away from the big day! I love the holiday season, but I rarely have time to scrap because I'm too busy decorating, celebrating and eating. I got a head start this year and dug into my pile of paper, chipboard and stickers from Crate Paper's Peppermint line to come up with this. Nico on Christmas morning with his pile of gifts and cute little grin. The pictures aren't the greatest - but the memories are. 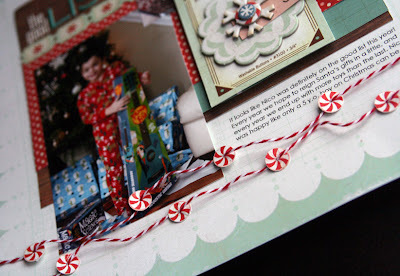 To make the garland, I punched out the peppermints from Crate's Candy Cane patterned paper. I pierced the center of the candy and threaded the pieces through some red and white twine. This is one of the favorite things about the layout and it was pretty simple to do. I am giving away a $20 gift certificate to twopeasinabucket.com. To enter, simply leave a comment and tell me what your favorite holiday is! I will be drawing a random winner on 11/8/11. Good Luck! And be sure to visit each blog for other prizes.